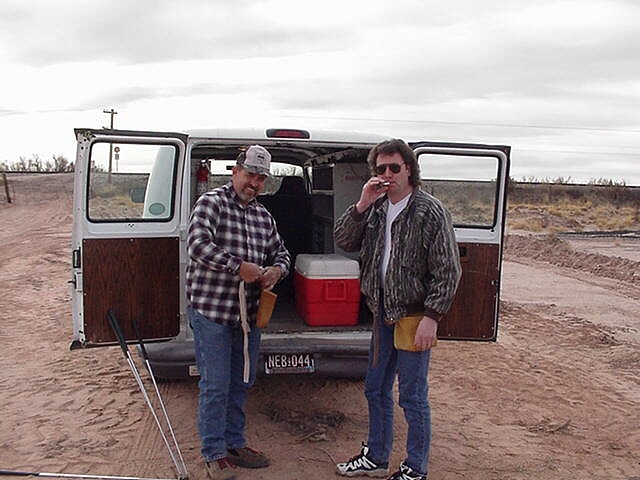 Myself (right) and fellow meteorite collector, dealer, hunter John Gwilliam (left) preparing to search the Holbrook strewnfield 8th February 2000. Dave Andrews is behind the camera. 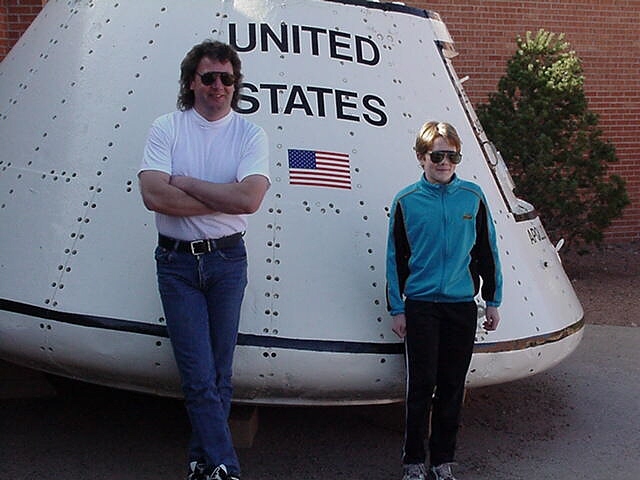 Searching Holbrook with my son Jamie, 7th February 2000. 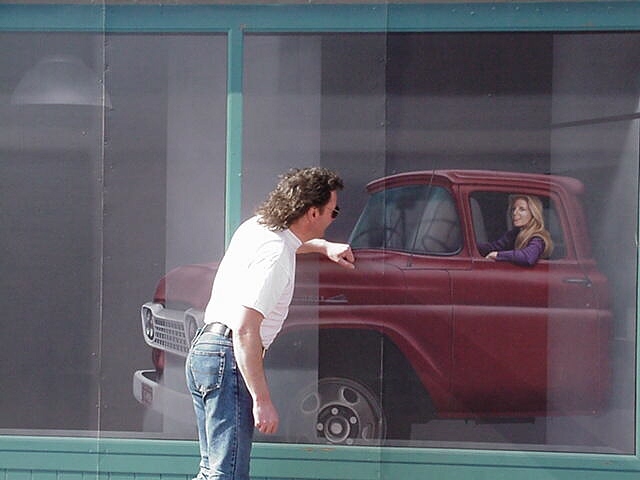 An hour later, Jamie found a small Holbrook fragment while walking back to the truck....I found zilch! Cameraman Dave Andrews found a beautifully fusion crusted Holbrook while we were all out searching again the following day. Meteorite strewnfields often cross over and merge with other strewnfields. 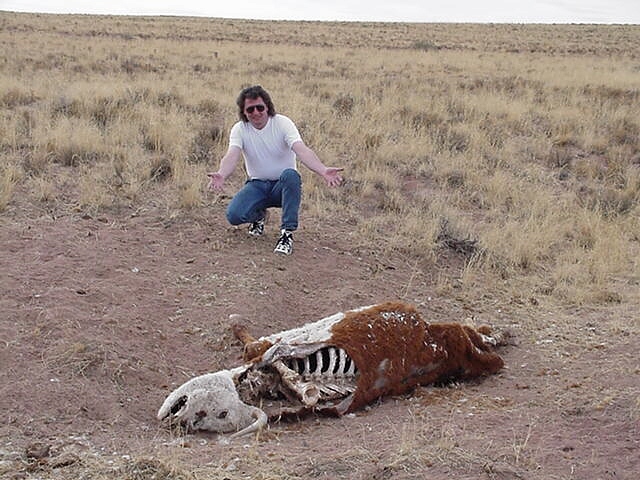 Here, we discovered that the Holbrook strewnfield is partly crossed by the Vaca Muerta meteorite strewnfield (for those that don't understand Spanish, the Vaca Muerta meteorite name actually translates into "dead cow"). 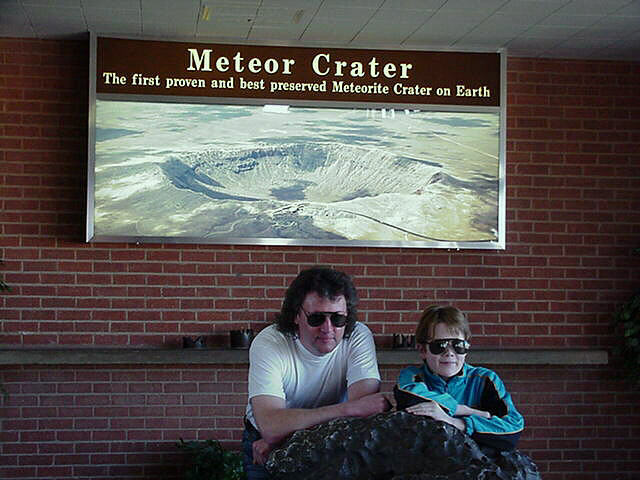 Jamie and I outside the ticket office of Arizona's Meteor Crater. Jamie and I posing with a large Canyon Diablo iron meteorite in the small museum at Meteor Crater. The proud museum attendant told us that "it was worth more than it's weight in gold"....I kinda doubt it somehow!! 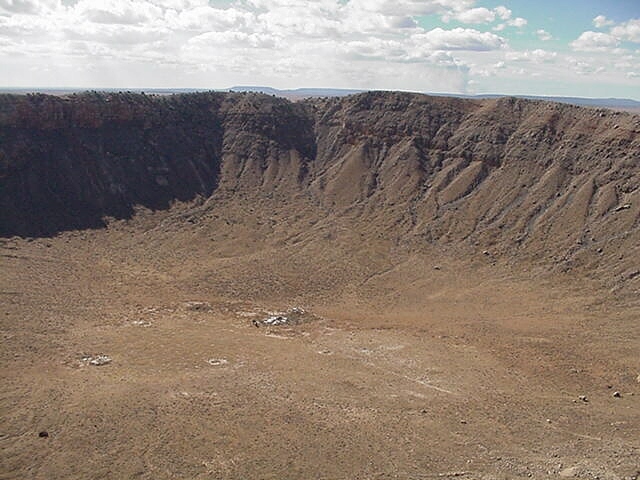 The crater itself. Seeing this sight through the museum's observation window for the first time is simply mind blowing. When the meteor hit 50,000 years ago, all of this (and more) was excavated in around two seconds flat! 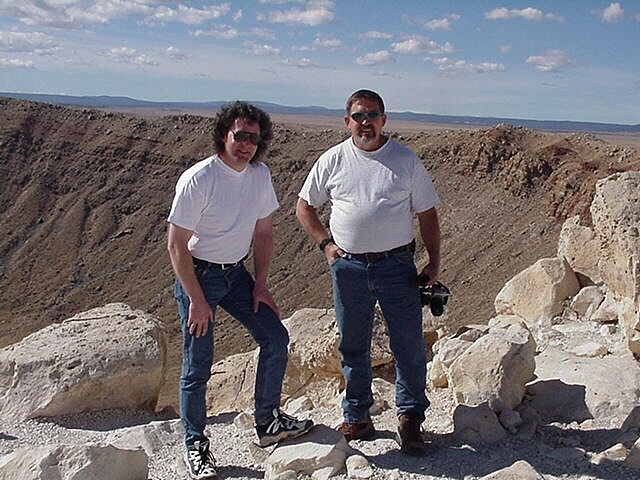 Me (left) and John Gwilliam (right) standing on the edge of Meteor Crater in the strong cold wind that rushes over the plains. Harvey Nininger's American Meteorite Museum lying derelict on Route 66 very close to Meteor Crater. 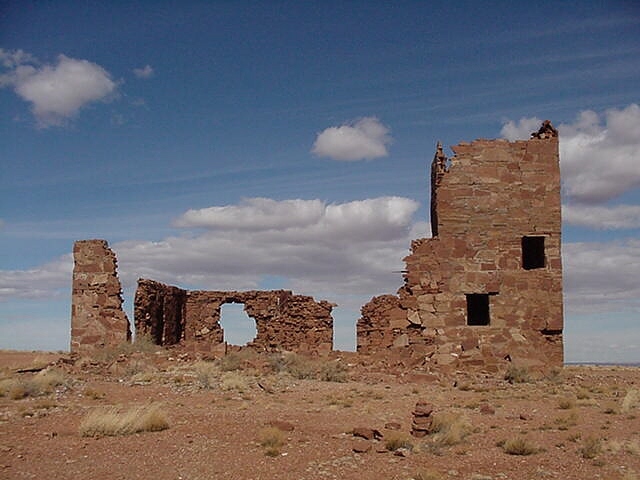 It's illegal to hunt or collect meteorites from the surrounding area, so of course I didn't do any searching here - neither did I bring home several small pieces of shale....no!...no!...no!! 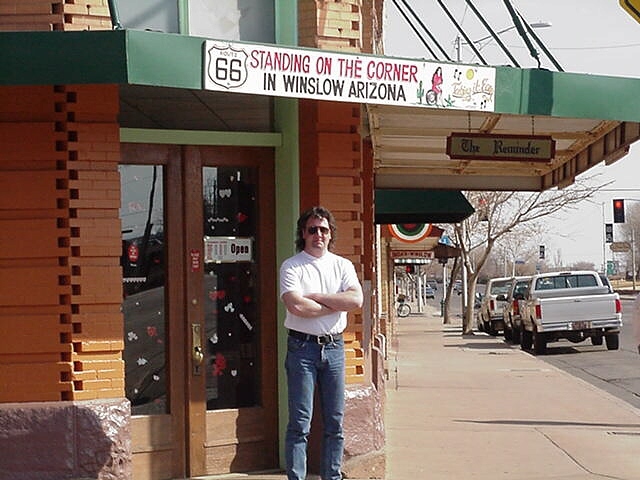 Me, Taking It Easy and "Standing on the corner in Winslow Arizona"
"When a girl my Lord in a flat bed Ford......"